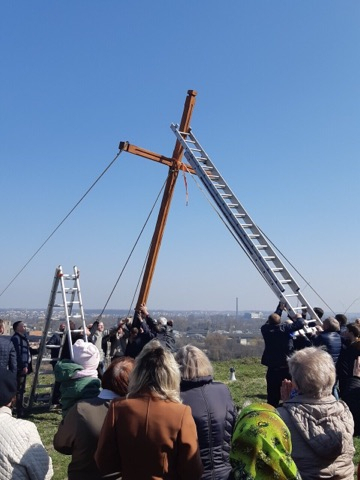 Thanks to local Lviv parishioners of the Ukrainian Greek Catholic Church, a cross destroyed by vandals last January was put on Sunday, March 31, on the Mount Baba-ros in the area of ​​Znesinnya. This is reported by the Department of Information of the UGCC. The previous cross had been put there 27 years ago, but before Christmas this year, unknown persons cut it off and threw it into the ravine. The new cross was put thanks to donations of the parishes of ​​Znesinnya. "The newly established consecrated cross will henceforth be the protection from Death,” parishioners of the local churches are convinced. “These territories, where the Holy Ascension Church is now located, were once royal estates: this is indicated by the first written mentioning of the urban archives of 1469. As some archival materials show, the first Christian church in Lviv was built here. These places, where people prayed for centuries, today are filled with the special God's grace of those who come with an open heart. Even the area of Znesinnya got its name from the name of the church. This event, namely the establishment of a new cross in the place where the previous one was destroyed, is an indication that here Christ lives in the hearts of many people,” said the rector of the Church of the Ascension of the Lord, Fr Mykhailo Horodysky.